The search for the perfect outdoor shading system begins and ends with US Custom Creations. 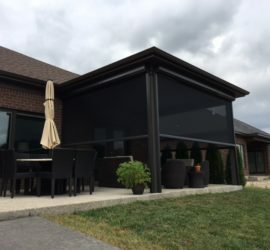 Since 1995 we have served Cincinnati, Ohio and Louisville, Kentucky along with surrounding cities by selling and installing motorized screens, retractable screens and fixed screen products along with custom under-deck ceilings that keep you dry and add beauty to your outdoor space. Solar Screens are designed to filter out the majority of the sun’s harmful effects while preserving your outdoor view and allowing you to better control your interior lighting. They can be used to reduce annoying glare on computers and television screens and diminish the harmful UV rays that fade your valuable interior furnishings. Motorized screens enclose and transform any outdoor space with the push of a button. 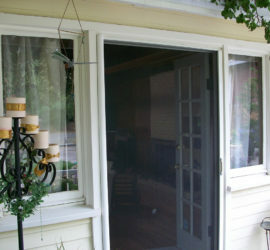 Make your patio, porch, balcony, or gazebo the ideal summer relaxation spot with adjustable screens. Don’t let stationary screens trap you when you could have the best of both worlds. Give your home an upgraded and stylish feature that will be the envy of your friends and neighbors. 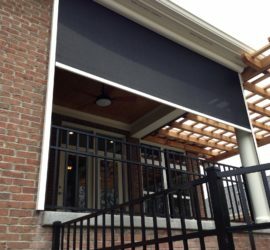 Our motorized retractable screens are powered by Somfy motors which are backed by a 5 year warranty. 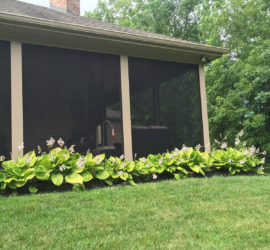 Whether you are looking for pest protection, solar protection, or privacy, our motorized retractable screens are versatile and serve many purposes. MotionScreens transform any architectural openings into a desired and functional living space. 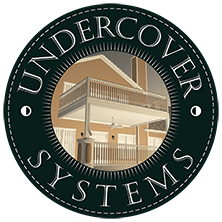 Undercover Systems comes in gray, tan, white, bronze, and is now offered in bead board. It can be installed with a vast selection of accessories, including recessed speakers, can or hanging lights, fans, retractable screens, mounted infrared heaters, and even TVs. 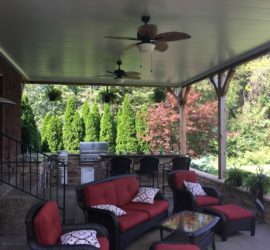 An Undercover System will transform the space under your deck from wet and messy to dry and tidy, perfect for entertaining, cooking, relaxing, and year-round enjoyment. Our Under-Deck Ceilings adds strength to your deck and value to your home with its sturdy manufacturing and aesthetic appearance. No longer will your lawn furniture and outdoor fixtures suffer winter weathering. By creating this outdoor living area, Undercover Systems will keep you and your furnishings dry all year long. Ohio: Cincinnati, Hamilton, Middletown, Dayton, Camden, Eaton, Miamisburg, Beavercreek, Leesburg, Oxford, Wilmington, Lebanon, Mt. Orab, Mason, Fairfield, Blanchester, Harrison, Bethel, Georgetown and other Metro Cincinnati, Ohio areas. Kentucky: Louisville, Jeffersontown, Mt. Washington, Shepherdsville, Fort Knox, Radcliff, Elizabethtown, Sonora, Hodgenville, Leitchfield, Caneyville, Falls of Rough, Morgantown, Rosine, Fordsville, Hartford, Beaver Dam, Bee Spring, Bonnieville, Munfordville, Bowling Green, Plum Springs, Smiths Grove, Campbellsville, Greensburg, Glasgow, Lebanon Junction, New Haven, Lebanon, Irvington, Bradenburg, Hardinsburg, Fordsville, Whitesville, Hawesville, Falmouth, Dry Ridge, Williamstown, Sadieville, Liberty, Springfield, Bardstown, Loretto, Taylorsville, Harrodsburg, Danville, Lancaster, Junction City, Willisburg, Shelbyville, Lexington, Nicholasville, Georgetown, Frankfort, Waddy, La Grange, Eminence, New Castle, Bedford, Owenton, Florence and other Metro Louisville, Kentucky areas. Indiana: Clarksville, Jeffersonville, Columbus, Sellersburg, Charlestown, Memphis, Starlight, Elizabeth, Lanesville, Georgetown, Galena, Palmyra, Ramsey, Corydon, White Cloud, New Middleton, Elizabeth, Palmyra, Borden, Scottsburg, Austin, Madison, Lawrenceburg, Brookville, Greensburg and surrounding Indiana cities. © 2019 US Custom Creations – All rights reserved. Website managed by Tennessee Web Technology Inc.